SAN DIEGO – The air was warm and breezy, the sunshine splashed down on the field at Petco Park out of a cloudless sky and everything seemed just right in this little slice of baseball heaven. It was a beautiful late summer Saturday morning in Southern California, one the players and coaches and their family members – along with dozens of scouts and Perfect Game personnel – associated with the Perfect Game All-American Classic weekend could certainly rejoice in. This year’s participants – the top 53 rising seniors from the class of 2019 – were gathered at Petco for the second of two practice sessions and the first round of the Rawlings Home Run Challenge. They had enjoyed a full day of activities on Friday and were easing their way into Saturday night’s PG All-American Classic Awards Banquet, set to be held for a second straight year at the wonderful Bayfront Hilton Hotel Promenade. Mixed in amongst the throng of prospects was talented Summit, N.J., right-hander Jack Leiter, the No. 19-ranked overall prospect in his class, and the No. 9-ranked right-handed pitcher. Leiter, who is rostered with the East team at the Classic, is the son of former big-league left-hander Al Leiter, and the 18-year-old has already lived a full baseball life. But this weekend is special. “This has been, so far, one of the coolest if not the coolest thing I’ve done in baseball,” Jack said after doing some easy throwing in front of Petco’s wall in leftfield while the position players from both the East and West teams took BP. The 16th annual PG All-American Classic will be played at Petco on Sunday with the first pitch scheduled for around 5:20 p.m. PDT; it will be televised live on MLB Network and also carried live on MLB Radio. Jack Leiter is a 6-foot, 190-pound righty with a mid-90s fastball who is set to begin his senior year at Delbarton School in Morristown, N.J.; he has committed to Vanderbilt. Delbarton School’s baseball program is pretty well represented at this year’s Classic with Leiter and his Green Wave teammate Anthony Volpe both on the East roster. Delbarton won a NJSIAA Non-Public A state championship in 2017 and finished as runner-up this spring. It is while performing at PG events that Leiter has made a name for himself nationally, earning Top Prospect List recognition at four PG showcases, including the prominent 2016 Junior National and the 2016 and 2017 Underclass All-American Games. He has also been named to five PG all-tournament teams while playing with the New Jersey-based Tri-State Arsenal organization. The PG Underclass All-American Games showcase is an event held on the Monday and Tuesday immediately after the Classic is played. The prospects that participate at the Underclass AA Games are encouraged to get to town a day early if at all possible so they can attend the Classic, and Leiter did so both years. Having sat in Petco Park and watched the Classic in both 2016 and ’17 made him even more determined to earn a spot on this year’s East roster. 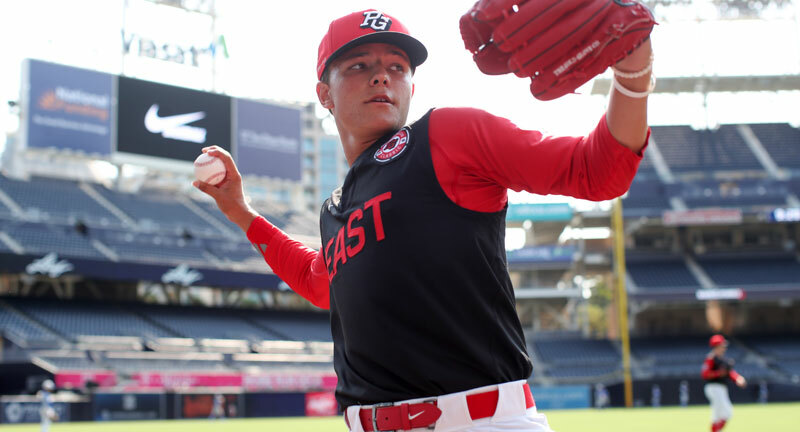 Every prospect selected for this weekend’s PGAAC was at the PG National Showcase at Tropicana Field in St. Petersburg, Fla., in June, and Jack Leiter found the experience especially satisfying. Both father and son praised Jack’s association with the Tri-State Arsenal with Jack calling the relationship “amazing” while noting that he’s been playing with a group of guys within the program that likes to have a good time and win plenty of ballgames along the way. That is a pretty tasty recipe, no doubt. Al Leiter has heard a lot of the negativity that sometimes surrounds the travel ball industry and he strongly disagrees with those negative views. He bases his own views on the experiences Jack has enjoyed – Al called them “phenomenal” – and said there has never been a moment when he felt like he had to intervene because Jack was being misused. Al Leiter pitched in 19 major league seasons (1987-2005) with four organizations, including seven seasons each with the Mets and the Blue Jays. He won 162 games and played in three World Series, winning titles with the Blue Jays in 1993 and the Marlins in 1997 and losing to the Mets in 2000. He threw a no-hitter for the then-Florida Marlins in 1996, the first in franchise history. That’s an impressive resume of accomplishments and there’s a lot there to look back upon fondly but Al Leiter is getting even more satisfaction out of watching his son perform on big stages that weren’t available to him when he was in high school. “This has been the most the most enjoyable baseball experiences for me than anything else I’ve done, and that includes my World Series championships, my no-hitter in the big leagues and all of that,” Al said. “When you’re performing, you don’t have the ability to just relax and enjoy it, you just have to perform; here, I’m tickled to death. Jack Leiter was 5 years old when Al retired from the game and he said he has some vague memories of his dad’s playing days and the times he got to hang out in big-league clubhouses and stadiums. He’s heard a lot of stories, of course, and he does have memories of attending All-Star Games and things like that in the years right after his dad retired. Now, with Al Leiter working at the MLB Network, he still gets to be around the big-league game quite a bit. Jack feels like he’s learned a lot just through his association with the guys his dad played with and the guys Al now reports on and talks to. Jack said his dad has impacted his baseball career in every way imaginable – both physically and mentally – and has helped him set up workout routines and regimens while also helping him work on his pitching mechanics. It is the latter that Al tried to work on with his son the most. Jack Leiter understands that he still has a lot of things to work on but has been pleased with his development thus far. He’s really gotten after it during his offseason workouts the last couple of years and has become both bigger and stronger; he told PG that he’s doing a lot more pitching than throwing. He hasn’t really mapped out his plans for the fall season yet. Last year, he pretty much shutdown right at the end of the summer and started his offseason workouts a littler earlier than in years previous and there’s a chance he’ll do the same thing this fall. He has made the 40-man trial roster for Team USA and he were to make the final cut, that would have him playing in November. When Al speaks, he makes no effort – and nor should he – to hide the pride he has in what his son has accomplished to this point in his baseball career. Every parent that has a son taking part in the PGAAC should be proud, he said, because their son is, after all, playing at an elite level for a high school kid. Choosing Vanderbilt as the place where he wanted to continue both his academic and baseball careers wasn’t as easy as some folks might think. Jack had narrowed his choices down to several “amazing” schools and when he asked others their opinion they all told him he couldn’t go wrong with any of them (he didn’t name the other finalists. “I just believe Vanderbilt is the best overall package of academics and athletics, and it’s in a good spot in Nashville,” he said. “I like country music and I love Nashville, so it should be a fun couple of years.” The 2019 MLB June Amateur Draft could easily come into play, so only time will tell. On Saturday morning, the start of the 16th annual PG All-American Classic was still 36 hours away but anticipation surrounding the event was already starting to build. Jack Leiter wasn’t sure exactly which inning East head coach Alan Kunkel would hand him the ball, but that really didn’t matter. He knows he’ll be ready. “Once I get out there, of course it’s going to be about competing, but basically the whole day and night is just going to be trying to enjoy it and have fun with some of the guys,” he said. “It’s a little different than pitching in, let’s say, a championship game but once I get out there I’m going to be trying to get outs and the adrenaline will definitely be flowing. The mindset doesn’t change at all – I’m always trying to get outs – and I’m going to try to have as much fun as I can (on Sunday). Al Leiter, the veteran of 19 major league seasons and MLB Network commentator, is ready to watch his son – and all the other All-Americans – get after it Sunday evening, as well.